Dr Laborde is from the Department of Orthopedic Surgery, Louisiana State University Health Sciences Center, New Orleans, Louisiana. Dr Laborde has no relevant financial relationships to disclose. Correspondence should be addressed to: James Monroe Laborde, MD, MS, Department of Orthopedic Surgery, Louisiana State University Health Sciences Center, #430, 3434 Prytania St, New Orleans, LA, 70005 (monroe@laborde.net). Figure 1: Ulcer Plantar to the First Metatarsal Head Before Tendon Lengthening (peroneus Longus and Gastrocnemius-Soleus Recession) (A). Ulcer Healed 6 Weeks After Tendon Lengthening (B). Figure 2: Ulcer Plantar to Fifth Metatarsal Head Before Tendon Lengthening (posterior Tibial and Gastrocnemius-Soleus Recession) (A). Ulcer Healed 6 Weeks After Tendon Lengthening and Wound Care (B). 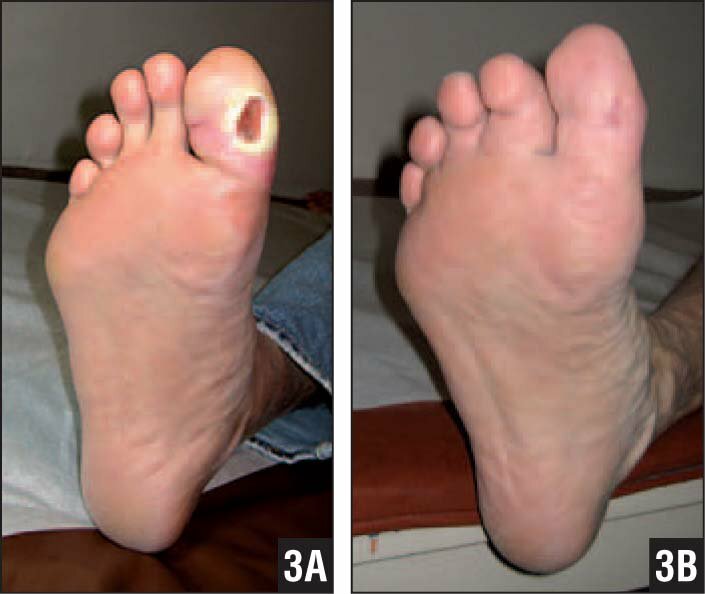 Figure 3: Toe Ulcer Before Toe Flexor Tenotomy (A). Toe Ulcer Healed 2 Months After Tenotomy (B). Mueller et al32 reported that 10 of 26 ulcers recurred 2 years after using Achilles lengthening alone. The addition of peroneus longus and posterior tibial to gastrocnemius-soleus recession yielded a lower recurrence rate of 3 of 18 ulcers at 45-month follow-up.26 Dayer and Assal35 added tendon procedures in the foot to gastrocnemius recession and peroneus longus transfer with similar low recurrence (1 of 22). The purpose of tendon lengthening is to decrease stress on the area of ulceration. Peroneus longus lengthening should decrease pressure on the first metatarsal head as posterior tibial lengthening should decrease pressure on the fifth metatarsal. Lengthening the gastrocnemius-soleus mechanism should decrease stress on the entire plantar forefoot (Figure 4). Armstrong et al27 confirmed that Achilles lengthening decreases pressure on the forefoot, recommending the procedure as an adjunctive therapeutic and prophylactic measure to reduce the risk of neuropathic ulceration. Figure 4: Tight Achilles Tendon Increases Pressure on the Forefoot (left). 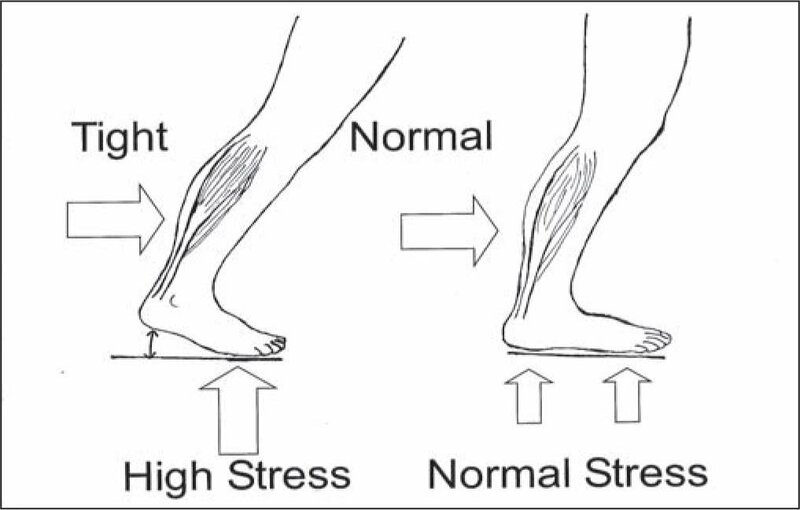 Normal Achilles Allows Normal Pressure on the Foot (right). Lin et al,25 Mueller et al,32 and Holstein et al34 lengthened the Achilles tendon by Hoke’s method of hemisection at 3 levels of the tendon.41 Holstein et al34 cautioned against overuse of Hoke’s method due to 7 of 75 Achilles ruptures and 11 of 75 heel ulcers in their patients with diabetic forefoot ulcers treated with tendon lengthening. Tendon lengthening has fewer complications and a lower recurrence rate than total contact casting.2,24–26,29,32–35,40 Dayer and Assal35 agree with Laborde26 that tendon lengthening rather than total contact casting should be considered the gold standard treatment for forefoot ulcers. Metatarsal head resection should be avoided if possible to decrease the potential for transfer ulcers resulting from an increase in pressure on the remaining forefoot. The metatarsal head should be removed if osteomyelitis is severe or if bone is fragmented, soft, or surrounded by pus or necrotic tissue. The metatarsal head should also be removed if osteomyelitis persists after the ulcer heals and antibiotics are completed. In Laborde’s26 study of 18 ulcers plantar to metatarsal heads that healed after tendon lengthening, only 1 patient had metatarsal head resection, and none developed a transfer metatarsal head ulcer. Infection and gangrene can progress to the point that amputation becomes necessary. In a study of diabetic amputations, 84% were attributed to foot ulcers.16 Ray amputation has a high complication rate in diabetics with forefoot ulcers.46 In one study, transfer ulcers occurred in 12% of ray amputations, additional amputation in 18%.46 Krause et al47 used transmetatarsal amputation to treat chronic diabetic forefoot ulcers. In their study, wound breakdown occurred in 9% of feet and transtibial amputation in 26%; 30% died. Lower complication rates have been reported with tendon lengthening for forefoot ulcers.26 Pinzur et al48 recommended Achilles lengthening be done at the same time as transmetatarsal amputation to increase the healing rate to 81%. Lieberman et al49 recommended Achilles tenotomy be done with midfoot (Chopart) amputation for gangrene and/or infection. Tendon lengthening appears to be preferable to amputation for forefoot ulcers, as does combining Achilles lengthening with ray or transmetatarsal amputation for cases of forefoot gangrene and/or severe infection. After 3 years of observation of diabetic patients with prior foot ulcers, reported amputation rates were 16% (80 of 514) and 17% (78 of 468).19,37 In a study of tendon lengthening for forefoot ulcers, no patients required amputation for progressive infection at an average 45-month follow-up.26 The number of patients in tendon lengthening studies was small by comparison, and the expected amputation rate decrease after tendon lengthening needs to be evaluated by a study of more patients. When all other treatments fail, more proximal major amputation may become necessary. Some foot problems in diabetics are primarily vascular, such as dry gangrene. Arterial disease can aggravate many other diabetic foot problems. Patients without pedal pulses should have vascular evaluation. Pulses are measured by palpation of the dorsalis pedis and posterior tibial arteries. Patients without both of those pedal pulses are referred for arterial Doppler study. Some authors have used the ankle-brachial index for lower extremity arterial evaluation. The ankle-brachial index is calculated by dividing systolic pressure at the ankle by that at the arm. An abnormal ankle-brachial index is ≤0.90.50 If the Doppler study shows near or complete blockage or if the ankle-brachial index is abnormal, vascular surgery evaluation should be obtained. After vascular and infection issues have been dealt with, patients with foot ulcers can be considered for tendon lengthening. Patients with neuropathic foot problems tend to have medical comorbidities, including the cause of the neuropathy. Diabetes mellitus and vascular disease are the most common comorbidities.26,29 Complications in these patients are frequent (Table). Soft tissue procedures such as tendon lengthening have fewer complications than bony procedures1–6,26,29; thus, they are performed first, and if they fail, bony procedures are done later. Tendon lengthening is promising, but more research is needed to better confirm its effectiveness for various types of foot ulcers. Only metatarsal head ulcers have level I and level III supporting evidence.25,32,35 Multiple level IV studies demonstrate the effectiveness of tendon lengthening for foot ulcers.24,26,29,33,34 The advantages to level IV studies are that the study populations are more likely to be representative of the population of interest and the results are closer to those obtained in clinical practice, have a higher relevance and external validity, and can be better applied to clinical practice.51 The aforementioned studies seem to support the use of tendon lengthening as the treatment of choice for diabetic forefoot ulcers. In the following discussion of ulcers in various locations, the level of evidence for references supporting recommendations is given in parentheses. Levels of evidence are explained in The Journal of Bone and Joint Surgery instructions for authors. Patients with ulcers and infection are treated with antibiotics, then offered debridement and tendon lengthening (IV26). Once the patient’s skin is prepped in the operating room, the foot is covered with a sterile glove. Tendon lengthening is done in the calf first and dressing applied. Then the glove is removed to debride the foot and lengthen toe tendons if needed. 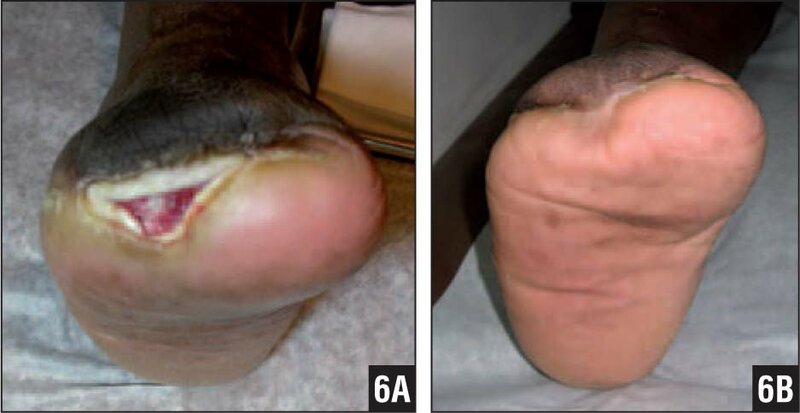 Patients with gangrene of the forefoot are offered debridement of gangrenous tissue and gastrocnemius-soleus recession to decrease pressure on the forefoot and aid wound healing (IV46,48) (Figure 5). Vascular evaluation and wound care are also recommended. If patients have delayed healing of a forefoot wound after debridement (V), transmetatarsal amputation (IV33) or Charcot arthropathy with or without ulcer (IV2), they are offered gastrocnemius-soleus recession (Figures 5–7). Patients with gangrene of the midfoot and/or hindfoot are offered transtibial or transfemoral amputation. Patients with progressive calluses are offered Achilles lengthening to prevent ulcers (V27) (Figure 8). 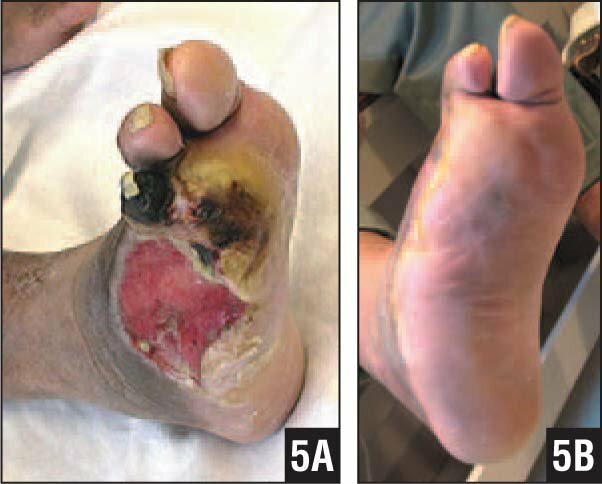 Figure 5: Ischemic Wounds Before Debridement Including Third Toe Amputation, Tendon Lengthening, and Wound Care (A). Healed Wound 2 Months Later (B). 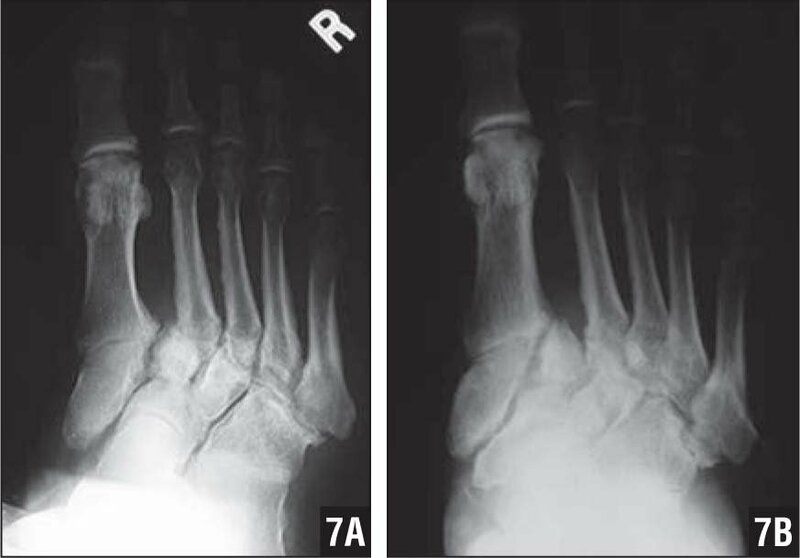 Figure 7: Charcot Arthropathy with Unstable Subluxation of First Cuneiform (A). Stabilization and Lack of Progression of Deformity 13 Months After Tendon Lengthening and Walking Boot (B). Figure 8: Bilateral Calluses Before Tendon Lengthening (gastrocnemius-Soleus Recession Bilaterally and on Right Peroneus Longus, Flexor Hallucis Longus, and Third Toe Flexors), Which Typically Resolve and Do not Progress to Ulcer After Tendon Lengthening (A, B). All patients with ulcers plantar to metatarsal heads are treated with gastrocnemius-soleus recession (I,32 III,25,35 IV24,26,34) (Figures 1, 2). Surgery is performed with the patient supine but the knee flexed and externally rotated. The foot is elevated on a stack of towels, and the surgeon is seated on the opposite side. Gastrocnemius-soleus recession is done using the Vulpius44 technique (IV1,26), transecting the gastrocnemius tendon just distal to the gastrocnemius muscle and transecting underlying aponeurosis of the soleus muscle in the mid-calf. The muscle is stretched in the operating room until 20° to 30° of ankle dorsiflexion is obtained. A midcalf posterior longitudinal incision 5 cm long is closed with staples after 3-0 absorbable sutures close the subcutaneous layer. Percutaneous triple-cut Achilles tenotomy is used for recurrent ulcers and if the patient can tolerate only local anesthesia. Peroneus longus (Z-type) lengthening is combined with gastrocnemius-soleus recession for first metatarsal ulcers (IV26). Incision is just proximal to the ankle joint. The tendon is repaired with a 2-0 absorbable suture so that there is no tension, while the first metatarsal is in maximum dorsiflexion and the foot is in maximum inversion. Posterior tibial lengthening is also performed for fifth metatarsal ulcers (V26). The incision is medial and 10 cm proximal to the ankle. At the musculotendinous junction, the part of the tendon over the muscle is cut so the muscle lengthens on full eversion of the foot. These incisions are closed in the same way as gastrocnemius-soleus recession. Z-type lengthening of posterior tibial tendon is combined with triple-cut Achilles lengthening for recurrent fifth metatarsal ulcers. Surgery is usually performed as an outpatient, and full weight bearing is allowed immediately in a cam walking boot, which is worn for 6 weeks. When surgery is bilateral, a walker or crutches are offered to the patient only if needed for balance. No local incision or ulcer treatment is done except for clean dressings. Skin staples are removed at 2 weeks. After 6 weeks, diabetic-type shoes are recommended. All plantar toe ulcers are treated with percutaneous toe flexor tenotomy at the proximal portion of the proximal phalanx (IV29,52) (Figure 3). Toe tenotomy is usually performed in the office, but occasionally it is performed in the operating room if the patient is there for some other procedure. Each toe is prepped with alcohol, and a local anesthetic is given. Each toe is held in extension so the tendons are palpable. Both flexor tendons are transected through a small transverse incision. Division of both flexor tendons is confirmed by the sudden increase in extension of the distal and proximal interphalangeal joints of the lesser toes. A sudden increase in extension of the interphalangeal joint of the hallux occurs after the flexor hallucis longus is divided. The incision is not sutured but is covered with sterile gauze. A postoperative shoe or sandal or extra-depth shoe is used at the patient’s discretion. Full weight bearing is allowed. Patients return in 3 to 5 days, then weekly until the ulcer heals. A dorsal ulcer of the proximal interphalangeal joint is treated with percutaneous extensor and flexor tenotomy. If correction is insufficient, percutaneous dorsal metatarsophalangeal capsulotomy and volar proximal interphalangeal capsulotomy are also performed. For interdigital ulcers of the first web space, patients are offered percutaneous adductor tenotomy and lateral capsule release of the first metatarsophalangeal joint. An interdigital ulcer of the lessor toes may also have percutaneous capsular release in the lessor toe in addition to the first toe surgery (V). Toe amputation is usually performed for osteomyelitis in the toe, which is not controlled with antibiotics. Figure 9: Midfoot Ulcer Before Tendon Lengthening and Walking Boot (A). Foot Appearance 9 Months Later (B). If the ulcer fails to heal or recurs, removal of the midfoot bony prominence (exostectomy) is performed (IV5). A longitudinal incision through the ulcer is used to remove the bony prominence. If the ulcer fails to heal or recurs, if there is no bony prominence and the foot is unstable, midfoot fusion is performed (IV6). A longitudinal incision over the unstable tarsals is used to remove joint surfaces and stabilize the tarsals with screws. No postoperative casts are used because of the fear of pressure sores in patients with neuropathy. Weight bearing is discouraged for 6 weeks. Other postoperative care is the same as for metatarsal ulcers except that a custom insert is used in the boot, and later in the shoe, to accommodate arch collapse or rocker-bottom foot deformity. Midfoot ulcers have healed more slowly than forefoot ulcers. Thomas and Huffman55 recommended lengthening the Achilles in Charcot arthropathy. For Charcot arthropathy, especially in the early stages, tendon lengthening has the potential to relieve pain, promote consolidation, prevent progression of deformity, and heal or prevent midfoot ulceration from arch collapse (IV2). Bony procedures are less commonly done if tendon lengthening fails. Amputation is used a last resort. Diabetic patients with foot ulcers have usually lost protective sensation because of neuropathy. They usually do not report foot pain unless they have severe arthropathy or infection. Diabetic patients without ulcers tend to have less neuropathy and, not uncommonly, develop painful foot problems such as Achilles tendinitis, metatarsalgia, foot arthritis, and plantar fasciitis. Even in patients without neuropathy, gastrocnemius recession has been recommended for the treatment of these problems.8–12 Anderson10 felt that gastrocnemius tightness causes metatarsalgia, plantar fasciitis, and Achilles tendinitis. He felt gastrocnemius tightness, if left untreated, causes progressive arch collapse, foot arthritis, and flat foot, which progress to posterior tibial tendon dysfunction and heel valgus. He reported 94% patient satisfaction using gastrocnemius recession for plantar fasciitis. He felt that gastrocnemius recession not only helped the pain of these conditions, but prevented the described progression. He also used gastrocnemius recession for pain relief in patients with arch collapse, foot and ankle arthritis, Achilles tendinitis, plantar fasciitis, and posterior tibial tendinitis (V8–12). Gastrocnemius recession may be useful in preventing these problems and foot ulcers (V10,27). Diabetic patients with painful hammer, mallet, or claw toes, especially with progressive toe callus, are offered toe flexor tenotomy after failure of nonoperative treatment. These procedures are also done both for pain relief and to help prevent future ulcers. Percutaneous volar proximal interphalangeal capsulotomy and/or percutaneous longitudinal pins are inserted if correction is insufficient. Pins are removed after 4 to 6 weeks. Open interphalangeal joint resection and fusion is avoided in patients without both pedal pulses and with infection. For interdigital corns of the first web space, patients are offered percutaneous adductor tenotomy, lateral capsule release of first metatarsophalangeal joint, and percutaneous longitudinal pinning. Interdigital corns of lessor toes may have percutaneous capsular release in the lessor toe metatarsophalangeal joint in addition to first toe surgery. Patients with painful arthritis of the first metatarsophalangeal joint are treated initially with percutaneous flexor hallucis longus tenotomy to relieve pain and prevent ulceration with less expected complications than with open surgery.59 If flexor hallucis longus tenotomy fails to relieve pain and if the patient has a pedal pulse, metatarsophalangeal fusion or resection arthroplasty is performed. More studies need to be done to determine if daily calf stretching can prevent calf tightness and progression to forefoot callus, forefoot ulceration, and Charcot arthritis in diabetic patients. Since calf stretching may help and probably would not harm diabetic patients, it seems reasonable to recommend prophylactic calf stretching to these patients. Armstrong et al27 recommended Achilles tendon lengthening to prevent reulceration in patients with prior ulcers. 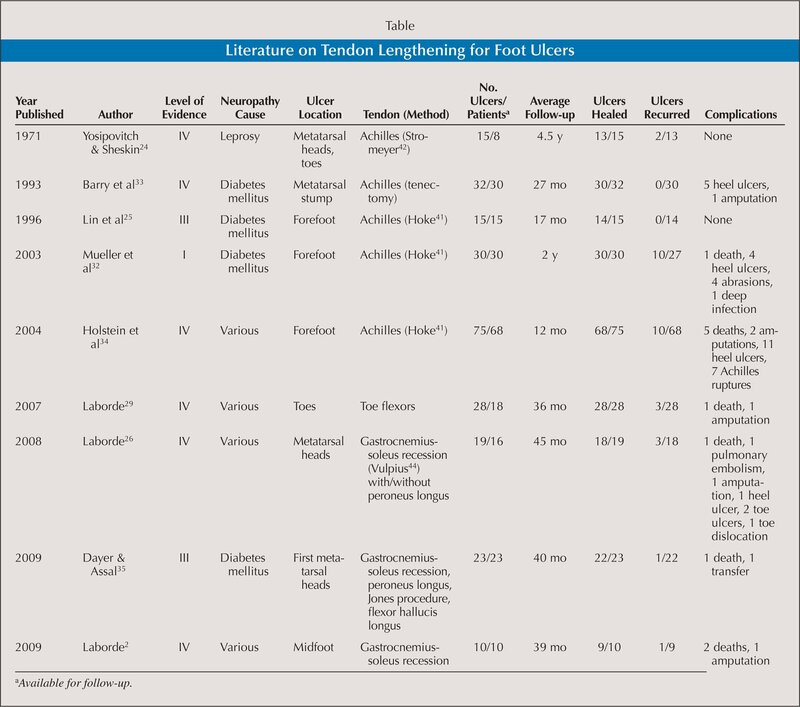 Additional studies should be done to determine if tendon lengthening is helpful in preventing ulceration in patients with progressive callus (Figure 8), prior ulcers, and impending ulcers. Barry et al33 found that Achilles tenectomy healed 94% of recurrent ulcers following transmetatarsal amputation (Figure 6). Thomas and Huffman55 recommended lengthening the Achilles in Charcot arthropathy. 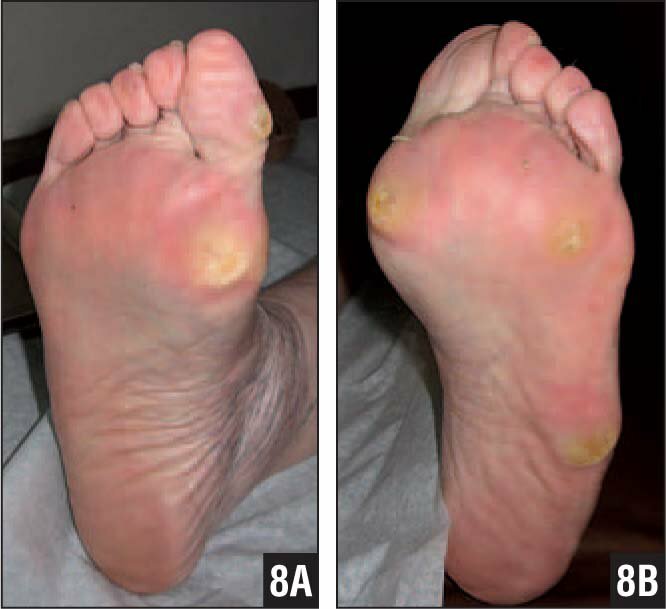 More studies should also be done to confirm that tendon lengthening heals midfoot ulcers (Figure 9),2 transmetatarsal stump ulcers (Figure 6),33 and ischemic wounds of the forefoot (Figure 5),48,49 and also to determine if the procedure prevents progression of deformity of Charcot arthritis of the midfoot (Figure 7)2,10 and ankle. Figure 6: Chronic Wound After Transmetatarsal Amputation (A). Healed Wound 6 Weeks After Tendon Lengthening (B). Preliminary results of tendon lengthening have been encouraging; however, further studies need to be done to determine if tendon lengthening relieves foot and ankle pain from multiple causes and if the procedure prevents foot ulcers, arch collapse, arthritis, and other foot problems. Fleischli JE, Anderson RB, Davis WH. Dorsiflexion metatarsal osteotomy for treatment of recalcitrant diabetic neuropathic ulcers. Foot Ankle Int. 1999; 20(2):80–85. Early JS, Hansen ST. Surgical reconstruction of the diabetic foot: a salvage approach for midfoot collapse. Foot Ankle Int. 1996; 17(60):325–330. McGlamary ED, Kitting RW. Aquinus foot. An analysis of the etiology, pathology and treatment techniques. J Am Pod Assoc. 1973; 63(5):165–184. Anderson JG, Maskill D, Bohay DR, Conaway D. Gastrocnemius recession: effective remedy for recalcitrant foot pain. AAOS Now. 2007; 4(3):10. Anderson JG. Gastrocnemius recession to treat isolated foot pain. Paper presented at: American Orthopaedic Foot & Ankle Society 38th Annual Winter Meeting. ; March 8, 2008. ; San Francisco, California. .
DiGiovanni CW, Kuo R, Tejwani N, Price R, Hansen ST Jr, Cziernecki J, Sangeorzan BJ. Isolated gastrocnemius tightness. J Bone Joint Surg Am. 2002; 84(6):962–970. National Diabetes Statistics, 2005. National Diabetes Information Clearinghouse (NDIC) Website. http://diabetes.niddk.nih.gov/dm/pubs/statistics/index.htm. Accessed July 2007. Consensus Development Conference on Diabetic Foot Wound Care: 7–8 April 1999, Boston, Massachusetts. American Diabetes Association. Diabetes Care. 1999; 22(8):1354–1360. Reiber GE, Boyko EJ, Smith DG. Lower extremity foot ulcers and amputations in diabetics. In: Harris MI, Cowie CC, Stern MP, Boyko EJ, Reiber GE, Bennett PH, eds. Diabetes in America. 2nd ed. Washington, DC: US Government Printing Office; 1995:408–428. Edelman D. An evidence-based approach to foot ulcer prevention in patients with diabetes. J Clin Outcomes Manage. 1999; 6(2):35–40. Pinzur MS, Slovenkai MP, Trepman E, Shields NN. Guidelines for diabetic foot care: recommendations endorsed by the Diabetes Committee of the American Orthopaedic Foot and Ankle Society. Foot Ankle Int. 2005; 26(1):113–119. Centers for Disease Control and Prevention. National diabetes fact sheet: general information and national estimates on diabetes in the United States, 2005. Atlanta, GA: US Department of Health and Human Services, Centers for Disease Control and Prevention; 2005.
van der Ven A, Chapman CB, Bowker JH. Charcot neuropathy of the foot and ankle. J Am Acad Orthop Surg. 2009; 17(9):562–571. Yosipovitch Z, Sheskin J. Subcutaneous Achilles tenotomy in the treatment of perforating ulcer of the foot in leprosy. Int J Lepr Other Mycobact Dis. 1971; 39(2):631–632. Lin SS, Lee TH, Wapner KL. Plantar forefoot ulceration with equinus deformity of the ankle in diabetic patients; the effect of tendo-Achilles lengthening and total contact casting. Orthopedics. 1996; 19(5):465–475. Armstrong DG, Stacpoole-Shea S, Nguyen H, Harkless LB. Lengthening of the Achilles tendon in diabetic patients who are at high risk for ulceration of the foot. J Bone Joint Surg Am. 1999; 81(4):535–538. Bader MS. Diabetic foot infection. Am Fam Physician. 2008; 78(1):71–79. Mueller MJ, Sinacore DR, Hastings MK, Strube MJ, Johnson JE. Effect of Achilles tendon lengthening on neuropathic plantar ulcers. A randomized clinical trial. J Bone Joint Surg Am. 2003; 85(8):1436–1445. Barry DC, Sabacinski KA, Habershaw GM, Giurini JM, Chrzan JS. Tendo Achillis procedures for chronic ulcerations in diabetic patients with transmetatarsal amputations. J Am Podiatr Med Assoc. 1993; 83(2):96–100. Strauss MB. The orthopaedic surgeon’s role in the treatment and prevention of diabetic foot wounds. Foot Ankle Int. 2005; 26(1):5–14. Guyton GP. An analysis of iatrogenic complications from the total contact cast. Foot Ankle Int. 2005; 26(11):903–907. Hsu JD, Hsu CL. Motor unit disease. In: Jahss MH, ed. Disorders of the Foot. Vol 1. Philadelphia, PA: Saunders; 1982:335–352. Stromeyer L. In: Rang M, ed. Anthology of Orthopaedics. Edinburgh, Scotland: Livingstone, Ltd; 1996:212–215. Myerson M, Papa J, Eaton K, Wilson K. The total-contact cast for management of neuropathic plantar ulceration of the foot. J Bone Joint Surg Am. 1992; 74(2):261–269. Vulpius O, Stoffel A. Orthopaedische Operationslehre. 2nd ed. Stuttgart, Germany: Ferdinand Enke; 1920. Saltzman CL, Zimmerman MB, Holdsworth RL, Beck S, Hartsell HD, Frantz RA. Effect of weight-bearing in a total contact cast on healing of diabetic foot ulcers. J Bone Joint Surg Am. 2004; 86(12):2714–2719. Pinzur M, Kaminsky M, Sage R, Cronin R, Osterman H. Amputations at the middle level of the foot. A retrospective and prospective review. J Bone Joint Surg Am. 1986; 68(7):1061–1064. Lieberman JR, Jacobs RL, Goldstock L, Durham J, Fuchs MD. Chopart amputation with percutaneous heel cord lengthening. Clin Orthop Relat Res. 1993; (296):86–91. Lountzis N, Parenti J, Cush G, Urick M, Miller F III, . Percutaneous flexor tenotomy office procedure for diabetic toe ulcerations. Wounds. 2007; 19(3):64–68. Johnson JE. Operative treatment of neuropathic arthropathy of the foot and ankle. J Bone Joint Surg Am. 1998; 80(11):1700–1709. Myerson MS, Henderson MR, Saxby T, Short KW. Management of midfoot diabetic neuro-arthropathy. Foot Ankle Int. 1994; 15(5):233–241. Thomas JL, Huffman L. Charcot foot deformity: surgical treatment options. Wounds. 2008; (3). http://www.woundsresearch.com/article/8476. Published March 2008. Accessed May 2008. By healing most forefoot ulcerations and lowering their recurrence rate, tendon lengthening should lower the incidence of metatarsal ulceration progression to infection and subsequent amputation.